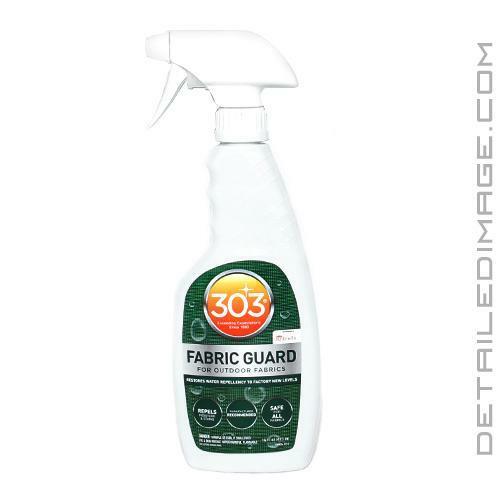 Just spray the 303 Fabric Guard (Formally known as the 303 High Tech Fabric Guard) on any fabric and the strong solution will bond to your carpets and seal the fibers for long lasting protection. Even the most careful owners can accidentally step in grease or have careless passengers that stain fabrics. The barrier created by the Fabric Guard will help repel stains, soil, harmful UV rays, water, mildew, salt, soda, coffee and anything else your fabrics come in contact with. This product has saved many people from scrubbing out embedded stains, excessive soil build-up, spills and more. It's designed for use on carpets, fabric seats, fabric/canvas convertible tops, fabric upholstery and more. It's critical to use spray on a coating of the Fabric Guard before winter, to prevent nasty salt stains that can be really tough to clean. Don't forget to use it in the summer months as well to prevent UV fading. The strong bond it forms with any fabric protects the surface while still allowing the fibers to breathe and remain flexible. Contamination build ups and accidents will happen and the 303 Fabric Guard will be there to protect your fabrics. 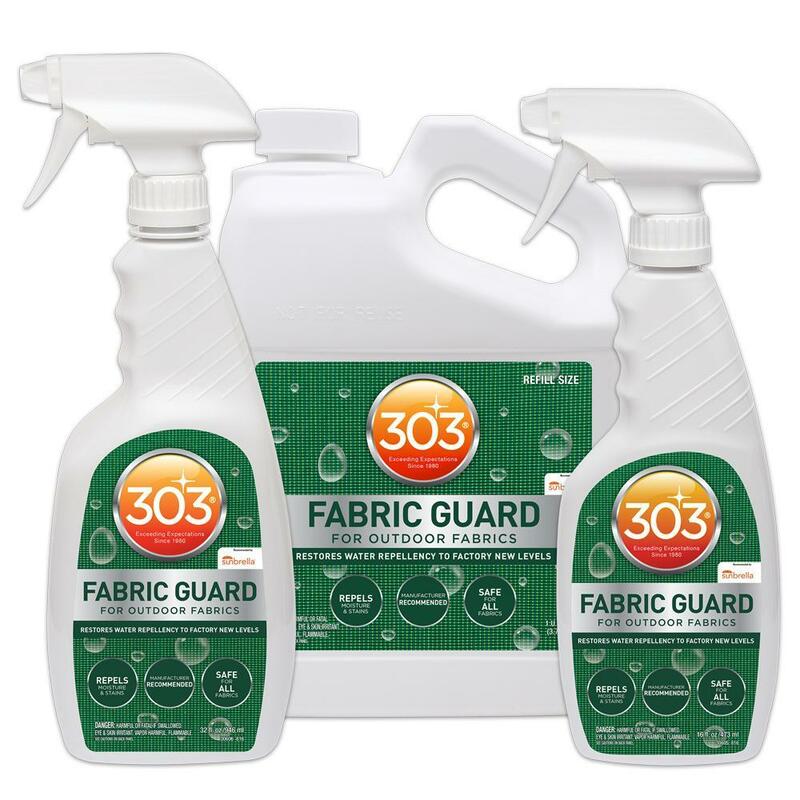 IMPORTANT: 303 offers two protection options for fabrics, the Fabric Guard and Stain Guard. Fabric Guard is solvent based and offers the strongest water repellency. You can use it on exterior fabrics (i.e. umbrellas, convertible tops, patio chairs, etc.) and on interior fabrics (i.e. carpets, sets, etc.). However, if you do use it on interior fabrics, 303 strongly suggests making sure the area is well ventilated! 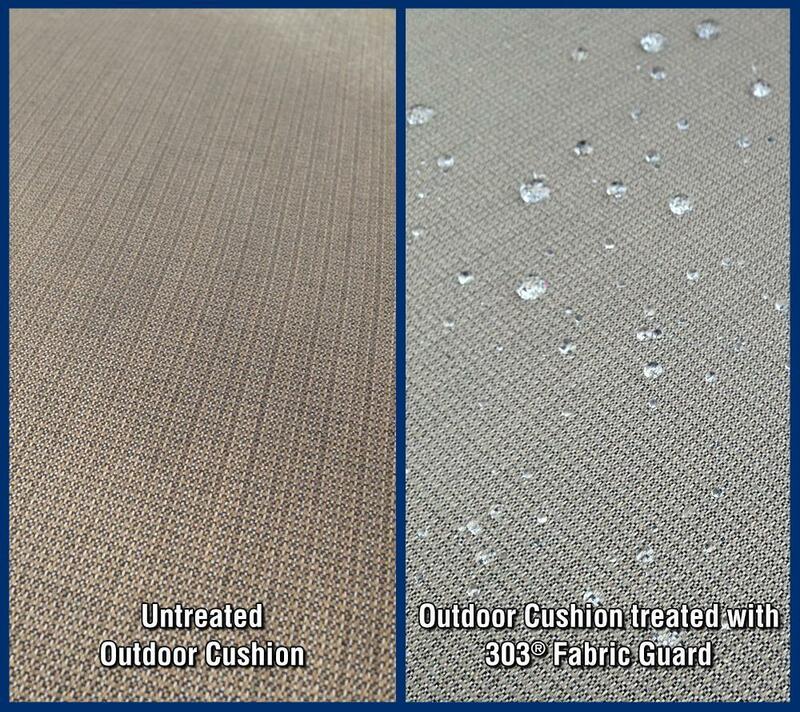 Stain Guard is water based and safe to use on all interior fabrics. It will however not work as well as Fabric Guard on your convertible top or exterior fabrics. 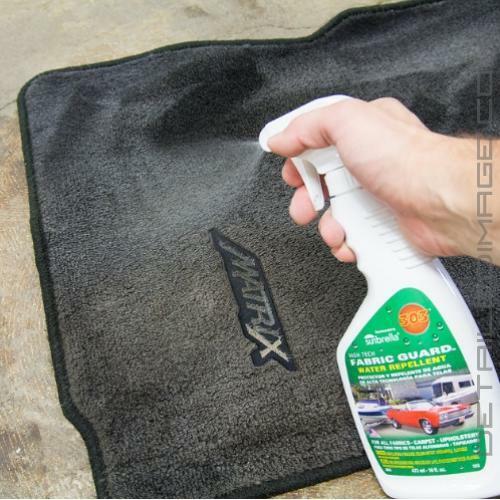 This product is incredibly easy to use, as you simply spray the Fabric Guard over the entire area and leave it to dry. For indoor and outdoor fabrics, awnings, umbrellas, boat canvas, auto interiors, convertible tops, carpeting, tents, rain wear, snow skiing apparel, silk, suede. BEFORE USING 303 HIGH TECH FABRIC GUARD (HTFG): Use only on thoroughly clean textiles, free of soiling and cleaning agent residues. For best cleaning results use 303 Fabric/Vinyl Cleaner or 303 Fabric/Vinyl Convertible Top Cleaner. Always test for colorfastness. Spray a hidden area with 303 HTFG. Wipe sprayed area with a white absorbent cloth. If any color rubs off, DO NOT USE. Use 303 HTFG on indoor & outdoor fabrics, upholstery & carpeting. DIRECTIONS: Spray until evenly wet, overlapping sprayed areas. Allow treated material to dry completely before use. Protect other surfaces from overspray. If sprayed onto adjacent surface, wipe up immediately. Note: Reduced coverage when applied with paintbrush or roller. Not for vinyl, clear vinyl, plastics, rubber, fiberglass or imitation suede. Use above 70°F. (Quicker drying/curing and best results on hot day, full sun). Treated material must be protected from rain/dew until completely cured. If these steps are done correctly, at this point the material will be water repellent. Curing 6-12 hours depending on temperature. Coverage: 75-100 sq. ft. per 16oz on lightweight fabric, 40-75 sq. ft. for heavier fabrics depending on material density and application method. 303 HTFG is non-toxic and odorless when dry. This product provides excellent protection and makes cleaning a breeze. I will add that if you plan on using this on interior carpets, it takes some time for the odor to go away. Good stuff for use on interior and exterior, along with a tonneau cover. Makes cleaning carpets and fabrics easier, easy to use, long-lasting effect. Will buy again.